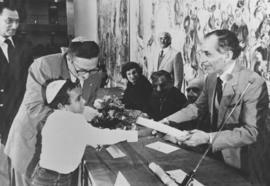 Photograph depicts a young boy and Rabbi Nahum Cohen receiving an award from Shlomo Hillel, the Speaker of the Knesset. 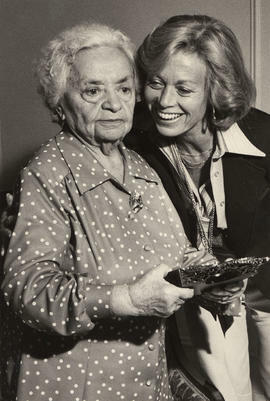 Photograph depicts (l-r) Mrs. Dora Yorsh and Mrs. S. Belzberg, with Mrs. Yorsh holding an award from the United Jewish Appeal.Written on verso: June 9/77. Photograph depicts two men, one of whom is Nathan Silver, holding a framed certificate.Written on the verso: "Page 7 - 2 col. Jewish National Fund. 2 x 3 1/4". June 25 '71. 47%." Photograph depicts two women, one of whom is possibly Naomi Frankenburg, holding an award. Photograph depicts (l-r) Izzy Faeme, Alec Jackson, and David Herman at a B'nai B'rith Membership Award ceremony.